[Classic] "The average citizen in this country does not have...the background that will enable him to make enlightened decisions concerning the selection and use of therapeutic agents." - Acting director, National Cancer Institute. [2016 April] 'Oops... It Wasn't Cancer After All,' Admits The National Cancer Institute/JAMA When the NCI report was released, it was a sort of vindication for those who had been advocating the position that a commonly diagnosed form of so-called “early breast cancer” known as ductal carcinoma in situ was in fact not inherently malignant and should not have warranted the conventional treatments of lumpectomy, mastectomy, radiation, and chemotherapy....On April 14th, in an article titled “Its Not Cancer: Doctors Reclassify a Thyroid Tumor,” theNew York Times reported on a new study published in JAMA Oncology which should forever change the way we classify, diagnosis and treat a common form of “thyroid cancer”: An international panel of doctors has decided that a type of tumor that was classified as a cancer is not a cancer at all. As a result, they have officially downgraded the condition, and thousands of patients will be spared removal of their thyroid, treatment with radioactive iodine and regular checkups for the rest of their lives, all to protect against a tumor that was never a threat. [2012 June] Vitamin Bashing or Bad Science? It seems beyond comprehension that the Journal of the National Cancer Institute can publish such nonsense as a paper claiming proof in the title. "The NCI...prospective trial...of...Laetrile could be neither controlled and randomized nor blinded...The lack of concurrent controls was partially offset by the fact that all patients were in advanced stages of a disease known to be almost uniformly and rapidly fatal. Any objective responses in tumor size or prolongation of survival could be identified by comparison with historical controls." - Arnold Reman, Editor, New England Journal of Medicine, "Closing the books on Laetrile" 1982. "The oral (Laetrile) had been 'toxified' by adding cyano-urea in the NCI...(NCI's) Mayo (Clinic) dismissed well responding patients to discard them from statistical evaluation...This kind of fraud which I expressed...and which was openly published...has...not resulted in any denial." 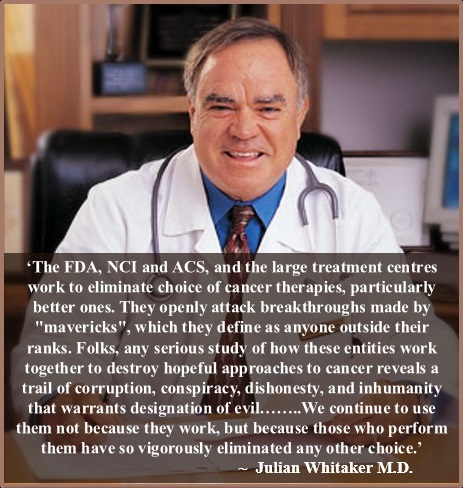 - Hans Nieper, MD, President, International Academy of Preventive Medicine; Director, German Society for Medical Tumor Treatment; author of over 200 articles, listed in Who's Who of World Science, and many other credentials. On the very day that the NCI announced Laetrile's alleged worthlessness..., West Virginia became the 24th state to allow the use of Laetrile ...In signing the bill into law, Gov. Jay Rockefeller said the study, 'made no difference at all.' - National Health Federation, July, 1981. "My ...studies on occupational cancer ...in ...industries was forcefully and abruptly brought to a halt in 1952 by an order of the Surgeon General ...(This followed) a protest by the Public Health Service (PHS) by ....(an) industry ...alleg(ing) that my activities were detrimental to their interests ...I was forbidden (by PHS) to contact, thereafter, state health departments and industrial concerns on all matters of occupational cancer. 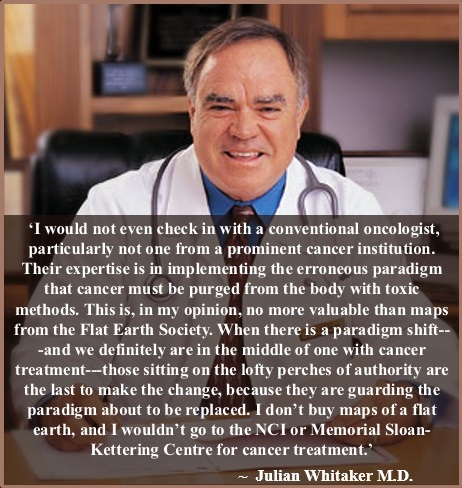 (I was) to discontinue all field work..." - Dr. Wilhelm C. Heuper, Chief, Environmental Cancer Section, NCI (In Larry Agran, The Cancer Connection). "...The NCI...retrospective analysis...of Laetrile(:) ...among 67 case records that were all submitted...the NCI...could find complete responses in only two patients..."
"We don't have any pesticides showing up in the food chain anymore." - NCI Director and ACS vice president, Dr. Frank Rauscher. "The data provided by the McNaughton Foundation certainly indicates some activity (of Laetrile) in animal tumor systems." - Dr. Carl Baker, Director, NCI 1970-1972. "Toxicity of Laetrile in dosages currently employed for human cancer is assumed to be minimal." - NCI Clinical Protocol for Laetrile. "Despite intensive effort over many years, the FDA, the AMA, the ACS (American Cancer Society), the NCI and independent researchers have been unable to find any scientific evidence that Laetrile has any effect on cancer." - FDA (press release, Feb 17, 1977.).
. Based on the available information, the Gerson method is not considered to be an effective means of cancer treatment, and the Institute does not believe that further evaluation of this therapy is necessary." ---NCI 1997.